Crystal Mountain is a relaxing escape offering unique experiences and activities. Located on the northeast side of Mt. Rainier, Crystal Mountain Resort is home to over 2,600 acres of skiing bliss or hiking delight …depending on the season. In the spring it begins, the transformation from a winter playground to a summer paradise. Wildflower meadows come alive and elk roam the hillsides. Miles of hiking, biking, and horseback riding trails wind through the national forest. Take a scenic, comfortable ride on the new Mt. Rainier Gondola up to the summit of Crystal Mountain for epic Mt. Rainier views. Choose to share a gourmet meal at the state’s highest restaurant, The Summit House. Take a turn at disc golf or enjoy an interpretive talk…Crystal Mountain is a summer wonderland. Up, up and up to Crystal Mountain’s summit…take the scenic 10-minute ride to some of the most renowned views of Mt. Rainer and the dramatic Cascade Mountains. The Mt. Rainier Gondola is open year-round (except for a couple of maintenance periods in the spring and fall). 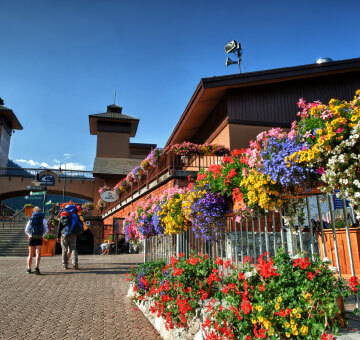 Enjoy a unique fine dining experience at the Summit House Restaurant, located just next to the Gondola. For Summer 2018, the Mt. Rainier Gondola will be open daily from June 22 – September 16. Read More. Located in the national forest, hiking trails crisscross the Crystal Mountain landscape. Choose from several area hikes, ranging from easy to difficult. Wander the wildflower meadows and spot deer and elk grazing. Explore over 35 miles of trails. Read More Download a Crystal Mountain Area Trail Map. From a fine dining experience at the Summit House to the lively, fun-filled atmosphere of the Snorting Elk Cellar, Crystal Mountain offers several tempting options for enjoying a meal. Looking for a quick bite? Celebrating a special event? Crystal has you covered. Read More. Saddle up and explore the beautiful Crystal Mountain back country on horseback. Crystal Mountain Outfitters offers tours that vary in length and are led by experienced guides. Experience the wilderness from a new perspective. Read More. Crystal Mountain Resort is pleased to offer an extensive Disc Golf course. This obscure sport is growing in popularity and Crystal’s course has recently expanded to include 30 holes in an upper and lower course. The course is free and open to anyone at any time. Bring your own disc or purchase one at several area retailers. Read More and Download the Course Map here. Take a walk with a local at the top of Crystal Mountain. This is a great opportunity to experience the beautiful natural landscape and learn more about the geology of the area, the wildlife that call Crystal home and the history of the area. Tours are offered during the summer, Friday through Sunday. Read More. Crystal Mountain Resort offers year-round activities and fun for every season. During winter, Crystal is a skiing mecca, consistently ranked as Washington’s number one winter playground for those with boards and skis. Guided snowshoe tours get you off the beaten track and into the wild and wonderful snow-covered forests. Crystal also boasts the largest and highest lift serviced ski resort in Washington. Visit Stay Crystal for more information on winter at Crystal Mountain.